Bicentennial logo commissioned by the American Revolution Bicentennial Commission. The nation had always commemorated the Founding, as a gesture of patriotism and sometimes as an argument in political battles. Historian Jonathan Crider points out that in the 1850s, editors and orators both North and South claimed their region was the true custodian of the legacy of 1776, as they used the Revolution symbolically in their rhetoric. The plans for the Bicentennial began when Congress created the American Revolution Bicentennial Commission on July 4, 1966. Initially, the Bicentennial celebration was planned as a single city exposition (titled Expo '76) that would be staged in either Philadelphia or Boston. After 6½ years of tumultuous debate, the Commission recommended that there should not be a single event, and Congress dissolved it on December 11, 1973, and created the American Revolution Bicentennial Administration (ARBA), which was charged with encouraging and coordinating locally sponsored events. David Ryan, a professor at University College Cork, notes that the Bicentennial was celebrated only a year after the withdrawal from Vietnam in 1975 and that the Ford administration stressed the themes of renewal and rebirth based on a restoration of traditional values, giving a nostalgic and exclusive reading of the American past. Reverse of the Bicentennial quarter, minted 1976. Reverse of the Bicentennial half dollar, minted 1975–1976. Reverse of the Bicentennial dollar (Type 1), minted 1975–1976. Reverse of the Bicentennial dollar (Type 2), minted 1975–1976. Bruce N. Blackburn, co-designer of the modernized NASA insignia, designed the logo. 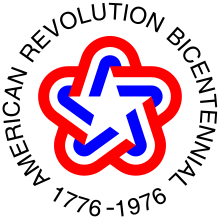 The logo consisted of a white five-point star inside a stylized star of red, white and blue. It was encircled by the inscription American Revolution Bicentennial 1776–1976 in Helvetica Regular. An early use of the logo was on a 1971 U.S. postage stamp. The logo became a flag that flew at many government facilities throughout the United States and appeared on many other souvenirs and postage stamps issued by the Postal Service. NASA painted the logo on the Vehicle Assembly Building at the Kennedy Space Center in 1976 where it remained until 1998 when the agency replaced it with its own emblem as part of 40th anniversary celebrations. 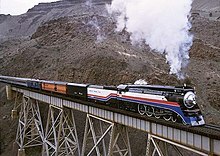 The official Bicentennial events began April 1, 1975, when the American Freedom Train launched in Wilmington, Delaware to start its 21-month, 25,388-mile (40,858 km) tour of the 48 contiguous states. On April 18, 1975, President Gerald Ford traveled to Boston to light a third lantern at the historic Old North Church, symbolizing America's third century. The next day, Ford delivered a major address commemorating the 200th anniversary of the Battles of Lexington and Concord in Massachusetts, which began the military aspect of the American Revolution against British colonial rule. Festivities included elaborate fireworks in the skies above major American cities. President Ford presided over the display in Washington, D.C. which was televised nationally. A large international fleet of tall-masted sailing ships gathered first in New York City on Independence Day and then in Boston about one week later. These nautical parades were named Operation Sail (Op Sail) and witnessed by several million observers. The gathering was the second of six such Op Sail events to date (1964, 1976, 1986, 1992, 2000, and 2012). The vessels docked and allowed the general public to tour the ships in both cities, while their crews were entertained on shore at various ethnic celebrations and parties. In addition to the presence of the 'tall ships', navies of many nations sent warships to New York harbor for an International Naval Review held the morning of July 4. President Ford sailed down the Hudson River into New York harbor aboard the guided missile cruiser USS Wainwright to review the international fleet and receive salutes from each visiting ship, ending with a salute from the British guided missile destroyer HMS London. The review ended just above Liberty Island around 10:30 am. Several people threw packages labeled "Gulf Oil" and "Exxon" into Boston Harbor in symbolic opposition to corporate power, in the style of the Boston Tea party. Johnny Cash was the Grand Marshall of the U.S. Bicentennial parade. Britain's Queen Elizabeth II and Prince Philip made a state visit to the United States to tour the country and attend Bicentennial festivities with President and Mrs. Ford. Their visit aboard the Royal Yacht Britannia included stops in Philadelphia, Washington, D.C., Virginia, New York, Connecticut, and Massachusetts. While in Philadelphia on July 6, 1976, Queen Elizabeth presented the Bicentennial Bell on behalf of the British people. The bell is a replica of the Liberty Bell, cast at the same foundry—Whitechapel Bell Foundry—and bearing the inscription "For the People of the United States of America from the People of Britain 4 July 1976 LET FREEDOM RING." Local observances included painting mailboxes and fire hydrants red, white, and blue. A wave of patriotism and nostalgia swept the nation and there was a general feeling that the irate era of the Civil Rights Movement, the Vietnam War and the Watergate constitutional crisis of 1974 had finally come to an end. In Washington, D.C., the Smithsonian Institution opened a long-term exhibition in its Arts and Industries Building that replicated the look and feel of the 1876 Centennial Exposition. Many of the Smithsonian's museum artifacts dated from the 1876 World's Fair in Philadelphia that commemorated the 100th anniversary of the independence of the United States. The Smithsonian also opened the new home of the National Air and Space Museum July 1, 1976. NASA commemorated the Bicentennial by staging a science and technology exhibit housed in a series of geodesic domes in the parking lot of the Vehicle Assembly Building (VAB) called Third Century America. 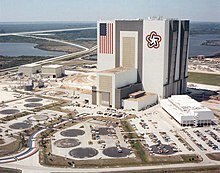 An American flag and the Bicentennial emblem were also painted on the side of the VAB; the emblem remained until 1998, when it was painted over with the NASA insignia. NASA originally planned for Viking 1 to land on Mars on July 4, but the landing was delayed to July 20, the anniversary of the Apollo 11 lunar landing. On the anniversary of the signing of the Constitution, NASA held the rollout ceremony of the first space shuttle (which NASA had planned to name Constitution but was, instead, named "Enterprise" in honor of its fictional namesake on the television series Star Trek ). Many commercial products appeared in red, white, and blue packages in an attempt to tie them to the Bicentennial. Liberty, a brand of Spanish olives, sold their product in glass jars replicating the Liberty Bell during that time. Products were only permitted to display the trademarked Bicentennial logo by paying a license fee to ARBA. Many national railroads and shortlines painted locomotives or rolling stock in patriotic color schemes, typically numbered 1776 or 1976, and many military units marked aircraft with special designs in honor of the Bicentennial. Disneyland and The Magic Kingdom at Walt Disney World presented America on Parade, an elaborate parade celebrating American history and culture, and featured the Sherman Brothers' song "The Glorious Fourth". The parade featured nightly fireworks and ran twice daily from June 1975 to September 1976. John Warner, later U.S. Senator from Virginia, served as ARBA director. The New Jersey Lottery operated a special "Bicentennial Lottery" in which the winner received $1,776 per week (before taxes) for 20 years (a total of $1,847,040). The overall theme of the entertainment of Super Bowl X, held January 18, was to celebrate the Bicentennial. Players on both teams, the Pittsburgh Steelers and the Dallas Cowboys, wore a special patch with the Bicentennial Logo on their jerseys; the Cowboys also added red, white and blue striping to their helmets throughout their bicentennial season. The halftime show, featuring the performance group Up with People, was entitled "200 Years and Just a Baby: A Tribute to America's Bicentennial". The United States Olympic Committee initiated bids to host both the 1976 Summer and Winter Olympic Games in celebration of the Bicentennial. Los Angeles bid for the 1976 Olympics but lost to Montreal, Quebec, Canada. Denver was awarded the 1976 Olympic Winter Games in 1970, but concern over costs led Colorado voters to reject a referendum to fund the games and the International Olympic Committee awarded the games to Innsbruck, Austria, the 1964 host. As a result, there was no Olympics in the United States in 1976 despite a last minute offer from Salt Lake City to host. However, Lake Placid would host the 1980 Winter Olympics, Los Angeles would eventually be awarded the 1984 summer games, and Salt Lake City would also eventually be awarded the 2002 Winter Olympics. As site of the Continental Congress and signing of the Declaration of Independence, Philadelphia served as host for the 1976 NBA All-Star Game, the 1976 National Hockey League All-Star Game, the 1976 NCAA Final Four, and the 1976 Major League Baseball All-Star Game at which President Ford threw out the first pitch. The 1976 Pro Bowl was an exception and was played in New Orleans, likely due to weather concerns. The Bicentennial Wagon Train Pilgrimage began a journey from Blaine, Washington on June 8, 1975 concluding at Valley Forge, Pennsylvania on July 4, 1976. The wagon train pilgrimage traced the original covered wagon trade and transportation routes across the United States encompassing the Bozeman Trail, California Trail, Gila Trail, Great Wagon Road, Mormon Trail, Natchez Trace Trail, Old Post Road, Old Spanish Trail, Oregon Trail, Santa Fe Trail, and Wilderness Road. Karen Steele was the first baby born on July 4, 1976, 12 seconds after midnight, and was referred to as the "Bicentennial Baby." She was featured on The Today Show and Good Morning America, and received commemorations from President Ford, New Jersey Governor Brendan Byrne, and a host of other notables. The Bicentennial Minutes were short vignettes aired on CBS from 1974 through the end of 1976 to mark the occasion. In the months approaching the Bicentennial, Schoolhouse Rock!, a series of educational cartoon shorts running on ABC between programs on Saturday mornings, created a sub-series called "History Rock," although the official name was "America Rock." The ten segments covered various aspects of American history and government. Several of the segments, most notably "I'm Just a Bill" (discussing the legislative process) and "The Preamble" (which features a variant of the preamble of the Constitution put to music), have become some of Schoolhouse Rock's most popular segments. In 1975, CBS aired a new animated Archie series on Saturday mornings called The U.S. of Archie; unfortunately the program was unsuccessful, and was off the air by September 1976. For the Bicentennial celebration, Hollywood filmmaker John Huston directed a short movie—Independence (1976)—for the U.S. National Park Service which continues to screen at Independence National Historical Park in Philadelphia to the present day (2018). The movie Rocky cited the Bicentennial in several scenes, mostly during Apollo Creed's entering; Carl Weathers dressed first as George Washington then as Uncle Sam. Canada through the National Film Board of Canada produced the book Between Friends/Entre Amis which was a photographic essay of life along the US-Canada border. The book was given to libraries across the US and special editions were presented to President Gerald Ford and other officials. The government of France and Musée du Louvre assembled an exhibit of paintings in cooperation with the Detroit Institute of Arts and the Metropolitan Museum of Art that traveled to Detroit and New York City after being shown in Paris. The exhibit, entitled French Painting 1774–1830: The Age of Revolution, included the work of 94 French artists from that period. Many of the 149 works in the exhibit had never been seen outside France and included Liberty Leading the People by Eugène Delacroix, Jupiter and Thetis by Jean Auguste Dominique Ingres and a portrait of Maximilien Robespierre by Adélaïde Labille-Guiard. Japan's government constructed and furnished the 513-seat Terrace Theatre of Kennedy Center in Washington. Fifty-three bonsai trees from the Nippon Bonsai Association were donated to the U. S. National Arboretum. King Juan Carlos I and Queen Sofía of Spain presented sculptures of Bernardo de Gálvez, a hero of the American Revolutionary War period and later Viceroy of New Spain; and Don Quixote, Cervantes' fictional hero, on June 3, 1976, on behalf of their nation. The United Kingdom loaned one of the four existing copies of the Magna Carta for display in the US Capitol. The document was displayed in a case designed by artist Louis Osman consisting of gold, stainless steel, rubies, pearls, saphires, diamonds and white enamel. This was on a base of pegmatite and Yorkshire sandstone. The document was displayed atop a gold replica from June 3, 1976 until June 13, 1977, when it was returned. The case and gold replica remain on display in the Capitol. King of Norway Olav V, Prime Minister of Norway Odvar Nordli, and Norwegian Government established the Vinland National Health Sports Center in Loretto, Minnesota. Italian tall ship Amerigo Vespucci in New York Harbor during the celebration. Six different Bicentennial buttons designed and sent by two art teachers to President Gerald R. Ford. A box of 15 billiard balls specifically designed to commemorate the Bicentennial. Commemorative pewter Bicentennial thermometer depicts an eagle above a laurel wreath with the "1776" and "1976" written inside. Wikimedia Commons has media related to United States Bicentennial. ^ In Bell (2005), William Gardner Bell states that when Washington was recalled back into military service from his retirement in 1798, "Congress passed legislation that would have made him General of the Armies of the United States, but his services were not required in the field and the appointment was not made until the Bicentennial in 1976, when it was bestowed posthumously as a commemorative honor." How many U.S. Army five-star generals have there been and who were they? states that with Public Law 94-479, President Ford specified that Washington would "rank first among all officers of the Army, past and present. "General of the Armies of the United States" is only associated with two people...one being Washington and the other being John J. Pershing. ^ Johnson, Lyndon B. (March 10, 1966). "Letter to the President of the Senate and to the Speaker of the House Proposing the Establishment of an American Revolution Bicentennial Commission - March 10, 1966". Internet Archive. Washington, D.C.: National Archives and Records Service. pp. 302–303. ^ Johnson, Lyndon B. (July 8, 1966). "Statement by the President Announcing the Signing of a Resolution Establishing the American Revolution Bicentennial Commission - July 8, 1966". Internet Archive. Washington, D.C.: National Archives and Records Service. pp. 713–714. ^ "Records of the American Revolution Bicentennial Administration [ARBA]". archives.gov. 1995. Retrieved May 24, 2011. ^ "Who's Having the '76 Birthday Party?". Associated Press. September 25, 1999. Retrieved April 20, 2010. ^ "H.R. 7446 ~ American Revolution Bicentennial Administration Establishment of 1973". P.L. 93-179 ~ 87 Stat. 697. Congress.gov. May 3, 1973. ^ Nixon, Richard M. (December 11, 1973). "Remarks on Signing a Bill Establishing the American Revolution Bicentennial Administration - December 11, 1973". Internet Archive. Washington, D.C.: National Archives and Records Service. p. 1009. ^ "Bicentennial: The U.S. Begins Its Birthday Bash". Time. April 21, 1975. Retrieved May 24, 2011. ^ Ryan, David (December 9, 2012). "Re-enacting Independence through Nostalgia – The 1976 US Bicentennial after the Vietnam War". FIAR: Forum for Inter-American Research. International Association of Inter-American Studies. 5 (3): 26–48. Retrieved January 29, 2014. ^ Ford, Gerald R. (December 31, 1975). "Remarks on the Eve of the Bicentennial Year - December 31, 1975". Internet Archive. Washington, D.C.: National Archives and Records Service. p. 2020. ^ Ford, Gerald R. (December 31, 1975). "The Bicentennial Year - December 31, 1975" (PDF). 90 Stat. 3072 ~ Presidential Proclamation 4411. Legis★Works. ^ "Restoring Old Glory and a Massive Meatball". nasa.gov. January 11, 2007. Retrieved May 24, 2011. ^ "Remarks of the President at the Old North Church" (PDF). fordlibrarymuseum.gov. April 18, 1975. Retrieved January 11, 2013. ^ "Bicentennial Bell". Independence National Historical Park. Retrieved August 3, 2013. ^ Rioux, Terry Lee (2005). From Sawdust to Stardust: The Biography of DeForest Kelley, Star Trek's Dr. McCoy. Pocket Books. p. 221. ISBN 0743457625. ^ "American Revolution Bicentennial Administration – Licensing/Use of Symbol and Flag" (PDF). John Marsh files. Gerald R. Ford Presidential Library. p. 31. Retrieved July 31, 2014. ^ Sanko, John (October 12, 1999). "Colorado only state ever to turn down Olympics". Rocky Mountain News. Archived from the original on June 1, 2009. Retrieved July 31, 2014. ^ Lyon, Bill (March 17, 2009). "Sports helped Philly celebrate Bicentennial". Philadelphia Inquirer. Archived from the original on March 30, 2009. Retrieved March 30, 2009. ^ "Larry and Pauline Asmus Papers, 1975-77: Bicentennial Wagon Train Participants". Gerald R. Ford Presidential Library and Museum. ^ "1976 Bicentennial Wagon Train to Valley Forge, PA". Facebook.com. Old Images of Montgomery County PA.
^ "Bicentennial Wagon Train Pilgrimage to Pennsylvania" (PDF). Gerald R. Ford Presidential Library and Museum. Bicentennial Commission of Pennsylvania. ^ "Bicentennial Wagon Train Pilgrimage to Pennsylvania 1975-1976 ~ Official Souvenir Program" (PDF). Gerald R. Ford Presidential Library and Museum. Bicentennial Commission of Pennsylvania. ^ "The Impact of Science on Society" (PDF). NASA. 1985. p. 2. Retrieved May 28, 2016. ^ "'Inventing of America' poses, answers queries". Eugene Register-Guard. June 27, 1976. Retrieved May 28, 2016. ^ "Lorraine Monk Books". LorraineMonk.com. Retrieved December 1, 2011. ^ Marsha Miro (March 2, 1975). "At the Institute of Arts, A Heroic Show from France". Detroit Free Press. p. D-1. ^ "Terrace Theatre Seating Chart". The Kennedy Center. Retrieved December 1, 2011. ^ "Museum History | National Bonsai Foundation". www.bonsai-nbf.org. Retrieved March 7, 2017. ^ "Magna Carta Replica and Display". Architect of the Capitol. Retrieved December 1, 2011. ^ Ford, Gerald R. (July 2, 1976). "Remarks Upon Accepting Norway's Bicentennial Gift to the United States - July 2, 1976". Internet Archive. Washington, D.C.: National Archives and Records Service. pp. 1950–1951. Capozzola, Christopher. "'It Makes You Want to Believe in the Country': Celebrating the Bicentennial in the Age of Limits" in Beth Bailey & David Farber, eds., America in the 70s (2004) pp 29–45. Gordon, Tammy S. The Spirit of 1976: Commerce, Community, and the Politics of Commemoration. Amherst, MA: University of Massachusetts Press, 2013. "Celebration of the Bicentennial of the American Revolution". Gerald R. Ford Presidential Library and Museum. Ford, Gerald R. (July 4, 1976). "Remarks in Valley Forge, Pennsylvania - July 4, 1976". Internet Archive. Washington, D.C.: National Archives and Records Service. pp. 1963–1965. Ford, Gerald R. (July 4, 1976). "Remarks in Philadelphia, Pennsylvania - July 4, 1976". Internet Archive. Washington, D.C.: National Archives and Records Service. pp. 1966–1971. American Revolution Bicentennial Administration (1977). "The Bicentennial of the United States of America : A Final Report to the People". Hathi Trust Digital Library. Washington, D.C.: U.S. Government Printing Office.